We’d love your help. Let us know what’s wrong with this preview of Habeas Corpse by Nikki Hopeman. To ask other readers questions about Habeas Corpse, please sign up. 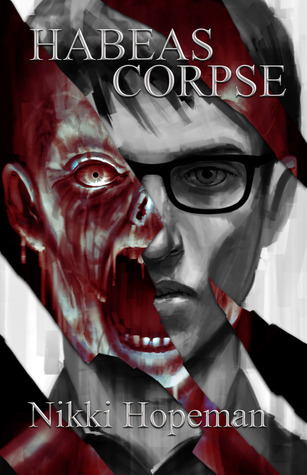 Nikki Hopeman’s first novel, Habeas Corpse, has been described by Michael Arnzen as “DEXTER meets Deadite”. Theo Walker isn’t your normal zombie, and Habeas Corpse isn’t your Every time horror-minded folks get together, someone sparks a discussion about whether zombies, vampires and werewolves are headed the way of the dodo. Are the familiar tropes too tired, too used up? We’re pretty saturated on these monsters, but I have to say, it’s for a good reason. When handled well, they are unstoppable. Wow, where do i begin. How about, "I hate zombie books". Zombies are my least favorite of the horror world. The only exception for me has been The Rising by Brian Keene...until now. This book was amazing. I was yelling out loud to Theo and caught up in the fantastically paced and perfectly plotted out lines, scenes, chapters, and overall story. Nikki Hopeman is talented. Women in Horror Month, combined with two thumbs up from fellow authors I trust, made me decide to grab this one and give it a ch Wow, where do i begin. How about, "I hate zombie books". Zombies are my least favorite of the horror world. The only exception for me has been The Rising by Brian Keene...until now. Women in Horror Month, combined with two thumbs up from fellow authors I trust, made me decide to grab this one and give it a chance (even though it's a zombie novel). I am ultra-mega glad I did. Thanks,Max. Thanks, Kristin. And thank you, Nikki for creating a wonderful piece of work. 1. I was grossed out at one point. Congratulations, that is nearly impossible at this point. 2. I actually enjoyed a zombie-centric story. It was a new take on two of my favorite things horror and procedural thrillers. Totally worth the night I didn't get enough sleep before work. If, like me, you are always looking for something new look no further; You have not read this story before. Horror isn't my typical genre, but I read this because a friend wrote it. Classifying it as a horror story alone is a disservice to this novel. It is a well written mystery with a great story line. Nikki takes on a popular topic of zombies in a new and refreshing way. I was not a fan of zombie books and wouldn't normally choose one to read. I will, however, be one of the first in line to read any sequels! I can't wait to see what Theo does next or what the future holds for him now. Thoroughly enjoyed this one. By far the most unique zombie novel I've ever had the pleasure of reading. Oh, this was lovely work. Absolutely disgusting at times and yet awesome, Nikki Hopeman did a fantastic job in bringing the reader a zombie novel which stands out from the masses of cliché works which are circulating among the masses. As someone who, pardon the pun, devours zombie-centric stories at racetrack worthy speeds, I’ve found myself lately bemoaning the absence of story-lines that don’t have me wishing the author had reach for some fresh brains themselves. I asked for a proper new zombi Oh, this was lovely work. Absolutely disgusting at times and yet awesome, Nikki Hopeman did a fantastic job in bringing the reader a zombie novel which stands out from the masses of cliché works which are circulating among the masses. As someone who, pardon the pun, devours zombie-centric stories at racetrack worthy speeds, I’ve found myself lately bemoaning the absence of story-lines that don’t have me wishing the author had reach for some fresh brains themselves. I asked for a proper new zombie novel, and Habeas Corpse delivered. Did it ever. Fans of the show iZombie will find a basically familiar premise in the fact that Theo is a zombie who works closely with the dead and the Medical Examiner, and gets psychic flashes from eating brains. However, where the limited episodes I’ve seen of iZombie tend to humanize the eating habits, Hopeman makes it very clear that her zombie eats like a proper Riser, or at least tries to. It’s interesting how she makes the reader feel sympathy for Theo and then goes into detail about his ‘investigations’ in such gruesome detail that a weak-stomached person may very well find their gorge rising. Even though with strong stomachs might experience a twinge of delicious discomfort. Aside from the zombie aspects, which are so pleasing, Hopeman also delivers a mystery in the form of the deaths that Theo is helping look into. She drops a few clues here and there which might ring faint bells, but (at least for me) avoids the bluntness which all too often causes the reader to figure out who the bad guy is before they’re even halfway through the story. Plus, just when I thought everything’s going to wrap up one way, she separated me from that idea in a happily grotesque fashion. This is a must-read if you like zombie novels. Stop what you’re doing, plunk down the money, and get this book. You won’t regret it. Not even for a second. It’ll delight you even as it makes your lip curl in disgust. In Pittsburgh, after massive radiation exposure, humans - both alive and dead - are trying to co-exist. What a great premise, and Hopeman brings her zombie hero Theo Walker (heh heh, nice twist there) to life (again) with a mix of sympathy and revulsion as he tries to solve a series of grisly murders. Not for the faint of heart, but a horror book with heart that makes for a suspenseful read. So, when is the next Theo story? I can't wait!!!!! This was a very enjoyable book. Was not expecting the usage of zombies on how it was done. Easy and quick read but still a book that I could not put down once started. Theo is a twenty-something burnout working for the forensics department. He lives in his parents’ basement and he’s never been in a real relationship. His best friend is his cat. Theo is also a zombie. But don’t worry, he’s not a “bad” zombie. And he’s not the only one. In Nikki Hopeman’s debut novel, she has constructed a rather unique world where the dead and the living co-exist. Due to an “Event”, sometimes human beings reanimate once they’ve died. But it’s okay, because there’s med Theo is a twenty-something burnout working for the forensics department. He lives in his parents’ basement and he’s never been in a real relationship. His best friend is his cat. In Nikki Hopeman’s debut novel, she has constructed a rather unique world where the dead and the living co-exist. Due to an “Event”, sometimes human beings reanimate once they’ve died. But it’s okay, because there’s medicine and treatments available to reduce the human flesh cravings (similar to methadone and rehab). They wake up, shower, and go to work just like the rest of us now. Of course, zombies aren’t exactly treated equally. Hopeman has cleverly touched upon themes such as prejudice and stereotypes by replacing the usual minorities with the undead. I’ve read similar attempts in other books, but Hopeman thankfully is not too extreme and the symbolism and comparisons run smoothly across the page. She also examines what exactly it means to be alive, whether you’re a human or a zombie. Admittedly, some of the introspective background scenes can feel a bit redundant after a while, but she does make her point well. Even in life, Theo never truly lived. It takes a series of grisly murders from a psychopathic serial killer to make him embrace the world at its fullest. He learns he has a talent unlike other zombies. By eating the brains of the recently deceased, he can relive their final moments. With the aid of his mortician friend, he begins to investigate a string of murders no one else seems to believe are connected. My only real gripe with the book was the killer turned out to be exactly who I thought it was the whole time. So, a bit predictable in that compartment, but don’t let that stop you from picking this one up. While it is not too mysterious, it is rather clever and well written. Oh, and at times, very disgusting. This is a zombie book after all, and it is quite graphic. A refreshing and unnervingly believable zombie tale that pulls on the heartstrings and makes the reader root for Theo, an undead forensic tech with special gifts. Nikki Hopeman creates a tolerant world where zombies and humans coexist as long as certain rules are followed—rules that Theo shatters. Well-written and pervasive. A new and innovative take on the Zombie novel. Theo works with forensics, where he provides a new take on police work. There is a procedural wrapped up in a horror novel, with touches of humor and pathos from our undead protagonist. Look out for this author, as I am sure there is much more to come from her. I love when I find a book with a story angle that surprises me! Theo is a very likable zombie, but that doesn't mean that the story is any less gory than you would expect for a zombie book! Great story, very well written! I look forward to reading more about Theo! I wouldn't call this a zombie book so much as I would call it a murder mystery with a main character who happens to be a zombie. Very well written. My only complaint is that it ends on such a cliffhanger. I hope there is a sequel in the works!!!! Nikki Hopeman loves the kind of horror that leaves her quaking in the back of the closet, the kind that won't let her close her eyes. Life before writing includes a bachelor’s degree in microbiology, a few years as a veterinary technician, floral arranger, blueberry picker, babysitter, and VW Beetle mechanic. She holds an MFA in writing popular fiction from Seton Hill University. When she’s not wr Nikki Hopeman loves the kind of horror that leaves her quaking in the back of the closet, the kind that won't let her close her eyes. Life before writing includes a bachelor’s degree in microbiology, a few years as a veterinary technician, floral arranger, blueberry picker, babysitter, and VW Beetle mechanic. She holds an MFA in writing popular fiction from Seton Hill University. When she’s not writing, she can be found in the tattoo chair or on her Harley Davidson. Nikki shares her home in Pittsburgh with her husband, two sons, two crazy corgis, and an angry hamster.